How do I know it’s soup season in my neck of the woods? Well, we had our annual freaky October heat wave last week and then the temperature plummeted about 20 degrees. Now every morning we wake up to fog and a chill in the air that doesn’t go away. Are you under the misconception as I was that living by the beach is all sunshine all the time? Ha! I keep telling my husband I want my money back. It’s chilly here! But no matter, I’m pulling out the sweaters and the stock pot and I am making SOUP! From now until late April, my kitchen turns into a stock-making factory every Saturday. I make gallons of it every week for my classes and us. I’ll be honest though, the hubby is sooooo over it. You should see his eyes roll every time I ask him to help me strain the stock. Inevitably a chicken foot flops out and completely freaks him out. But he puts up with it because his favorite food group is soup and he knows homemade chicken stock is magic stuff. If you are getting more and more comfortable in the kitchen, it’s time to step it up and start making stock from scratch. You will not believe the difference in taste. Plus it’s a gajillion times better for you than boxed. Check out my post here on home made chicken stock. For all you veggies out there, here’s the link to learn how to make vegetable stock from scratch. Enough about that. Let’s talk about the soup I actually made, Tortilla Soup. Y-um! 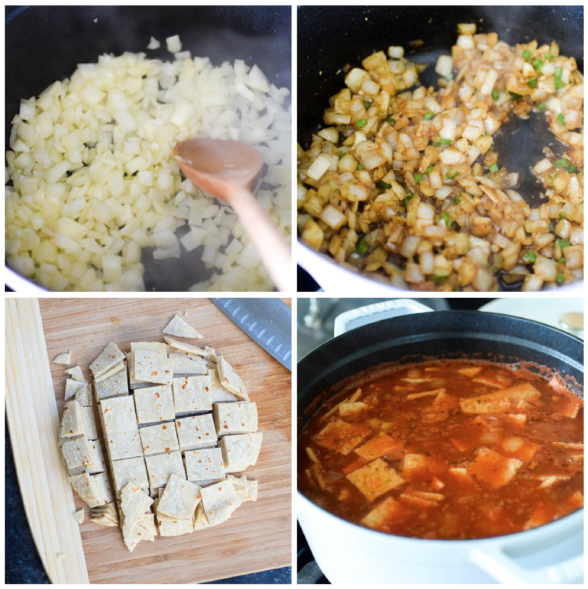 This is a very different version of the tortilla soup you might be used it. It’s not thin and brothy, but thick and hearty and it takes about 15 minutes to make, provided you already have stock made. If I had to make up another name for this, I would call it “Mexican Tomato Soup” or “Pappa al Pomodoro goes to Mexico.” Cumin, which is one of my most favorite spices, adds the distinctive earthy flavor that you would recognize from chili or taco seasoning. 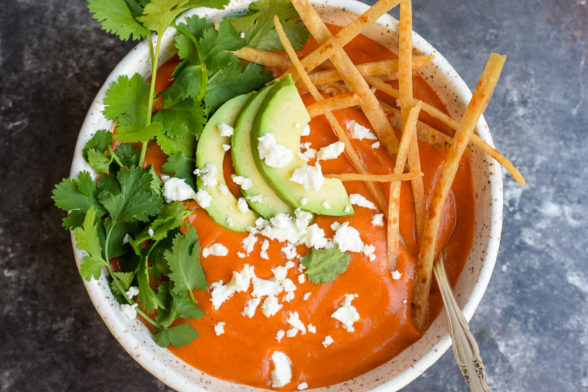 But what is so unusual about this soup is that the corn tortillas are pureed with the tomatoes and broth, as opposed to adding fried tortilla chips on top. The softened corn tortillas add great flavor and thicken the soup at the same time. (It’s a great use of stale tortillas.) I wish I had thought of this bit of genius, but I didn’t. I tweaked a recipe I found in The Real Food Daily Cookbook, based on the vegan LA restaurant by the same name. I love adding cubed avocado and chopped fresh cilantro on top, but I let everyone do their thing. There’s always enough leftover for the next day’s thermoses to which I also like to add a little cooked chicken. (I’m big on protein at lunchtime so the kids don’t fall asleep in class.) Fresh tomatoes are on their way out, so if you can use them go for it. The other night I used Bionaturae organic crushed tomatoes and tomato paste in a glass jar (not a fan of canned tomatoes.) I made this soup last year on Halloween, which is around the corner. I always make sure everyone has eaten a proper meal before going out to trick or treat. Full bellies can’t fit quite as much candy as empty ones. Heat the oil in a heavy stockpot over medium heat. Add the onions and garlic and sauté for 5 minutes or until tender and translucent. 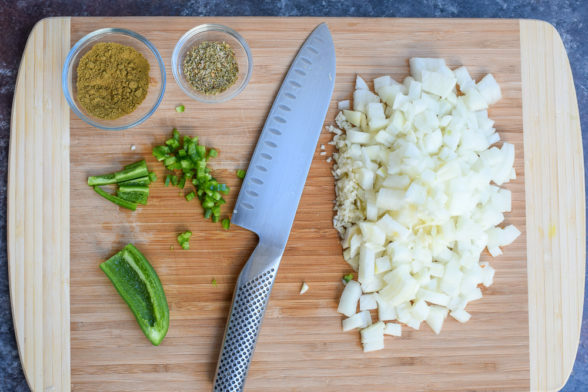 Add the jalapeno, cumin, oregano, salt, pepper and shoyu, and sauté 1 minute longer. Stir in the stock, tomatoes with juice, and tomato paste. Bring to a boil. Lower the heat and simmer, partially covered for 10 minutes, or until the tomatoes are tender. Add the tortillas and simmer 10 minutes longer, or until the tortillas are super soft and falling apart. Using a handheld immersion blender, blend the soup in the pot until smooth. Or carefully puree in batches in a blender. 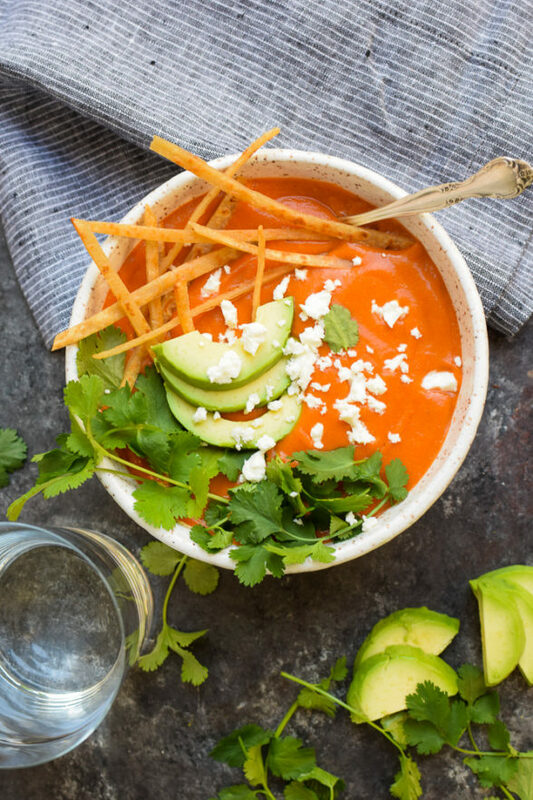 Ladle the soup into bowls and garnish with cilantro and avocado. *For a little more kick, add the ribs and seeds from the jalapeno to the soup. Could I do this in the Insta Pot? Want to make it tonight! IT’s such a tasty and easy soup. You can do it in an Instant Pot, but I don’t think you’ll save any time by doing so. Remember it takes time for the machine to come up to pressure, probably about 10 minutes, and then another minute to come down from pressure if you do a quick release. The soup only takes 20 minutes on the stove. MAYBE you’ll save 4 minutes by making it in the Instant Pot….. This soup was so good! And easy. Which I love. I made the vegetable quesadillas with it and it was perfect. The kids took some the next day in their lunch with a grilled cheese. My husband also had it for lunch. I really love corn tortillas so the flavor was excellent. As always, thank you! Who doesn’t love an easy and delicious recipe?! 🙂 Thanks, Monica! Can I leave out the cumin? I really do not like the smell when I cook with it – so much so I cannot eat anything that I have made that has cumin in it! Don’t add it! maybe use 1 teaspoon of chili powder instead. I am soooooo glad I found your website!! Last night we made Harira and tonight the Tortilla Soup. Another hit in my house and requests that it be included into our regular menu plans! So quick and easy after a long day at work! this is delicious! we loved it. i have so much of it – how long is it good for in the fridge? and, does it freeze well? thanks! You can keep it in the fridge 3-4 days. I haven’t tried freezing it, but I know you can freeze tomato sauce, so I think it’s worth a shot! Hi Pamela: My daughter must have gone on your site because she is coming home tonight and she asked me to make your Tortilla soup tonight and also the Greek salad so that is what I am doing tonight even though I could not find any sunflower sprouts anywhere!! we have to do without it. My house smells delicious with the soup already even though it is not quite done yet. Thanks again for all you do, the pictures look amazing too, you have become quite a photographer!!! That’s very cool that your daughter is checking out the site! Thank you for the compliment about the photography, especially coming from you, but it is not my strength! Every thing came out perfectly, the soup was amazing and the salad very refreshing,every one loved it. thanks again. Thanks for your enthusiasm, Linleigh! Yes, “carefully” puree in a blender. Go get an immersion blender. I’m obsessed. Pamela – i especially like the sound of your recipe because it doesn’t suggest removing the tomato skins and seeds from the soup (i would normally push my soup through a sieve to clear them out) – are you saying it’s ok to leave them in, my soup making would definitely speed up!? You are pureeing the tomatoes, so it’s fine to leave the peels. You can cut the tomatoes in half around the “equator” and give the halves a quick squeeze to remove most of the seeds. But either way, you’ll be fine. This soup is easy peasy. I thought cauliflower was the only vegetable I didn’t like….until I made the roasted cauliflower with curry power. I ate the whole thing myself & loved it! do you think it would work with broccoli? A cauliflower convert? Fantastic! Now go make the Cauliflower and Roasted Garlic soup — it’s fabulous. You know, I don’t think I would like the rice recipe as much with broccoli, but it wouldn’t be bad. Roasted broccoli has a stronger flavor and isn’t quite as sweet. I would try it with carrots, squash or yams if you’re looking for something different.